DRISCOLL BABCOCK GALLERIES presents Secret Identities: Superheroes and Selfhood, a group exhibition featuring artists whose works address how identity is experienced, constructed and performed. 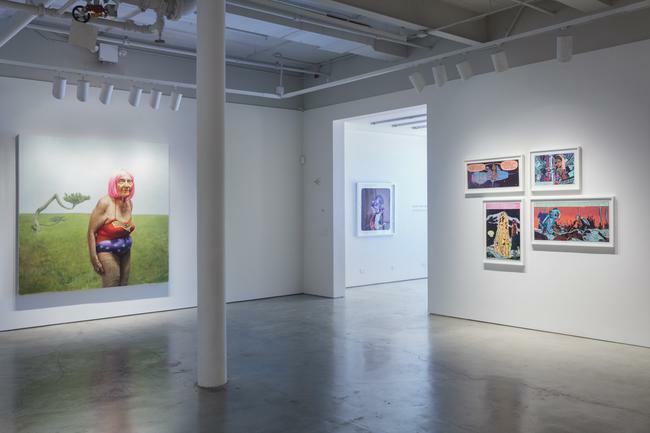 Taking as its starting point the popular icon of the superhero, this exhibition explores ways in which contemporary expectations and expressions of identity are complicated by current artistic practice. Including paintings, digital prints, and needlework by Katherine Bradford, Caroline Wells Chandler, Chitra Ganesh, Mark Newport, Nathaniel Mary Quinn, Peter Williams, and Jason Bard Yarmosky, these works address the experiences of marginalized or unsung outsiders, subverting and reinventing popular narratives of empowerment and heroism. Mark Newport and Katherine Bradford explore the superhero as a meditation on masculine strength, excavating the humble and vulnerable “everyman” beneath his heroic, hyper-masculine body. Newport’s hand-knit acrylic superhero costumes hang limply in the gallery, devoid of the strong, well-articulated and heroic body we imagine would embody them. 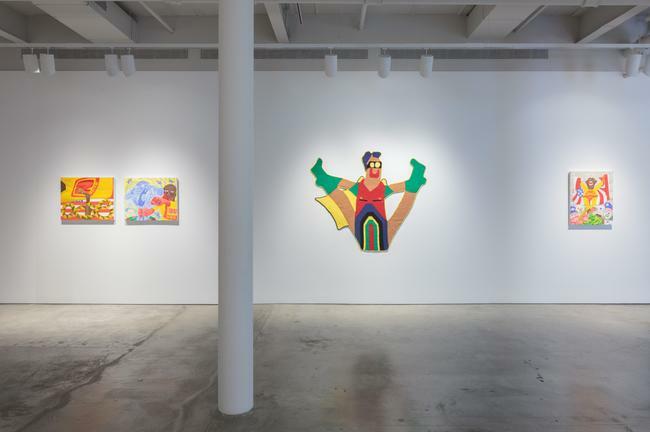 Bradford’s paintings of Superman similarly dismantle his iconic strength, imagining him as lumpy, awkward, and soft-limbed, floating tentatively through the sky even as he dares to perform supernatural feats of rescue. In a similar way, Jason Bard Yarmosky’s haunting, hyper-realistic oil painting WHISPERING GRASS depicts his grandmother Elaine wearing a Wonder Woman costume. It is the first painting Yarmosky has made of Elaine that explores the profound impact of her dementia. Here, the joyful simplicity of childhood notions of heroism are poignantly juxtaposed with the changing expectations, roles and concerns of aging. Yarmosky’s grandmother becomes an unlikely heroine, a symbol of a life lived through perseverance, strength and determination. Chitra Ganesh and Caroline Wells Chandler closely examine expressions of marginalized sexuality. Ganesh‘s digital collages integrate her own pen and ink drawings and narrative text with fragments of Amar Chitra Kathas,1960s-era Indian comic books that delivered prescriptive cultural narratives to a popular audience. The result is a psychedelic, science-fiction landscape in which Ganesh offers a goddess-like female protagonist as an alternative narrative of femininity, empowerment, and desire. Chandler, in turn, explicitly addresses the politics of queer identity, responding to the ways contemporary culture obsesses over and scrutinizes the bodies of transgender individuals. The six-foot-wide, hand-crocheted THE BOI WONDER depicts a masked, caped figure with double mastectomy scars, arms and legs splayed exuberantly to reveal a rainbow genitalia that resists binary readings of sexual specification. Peter Williams’ paintings from the series Common & Proper Nouns: The N–Word feature the eponymous African American superhero, “N-Word,” who wears an American flag cape and protects citizens from the police. 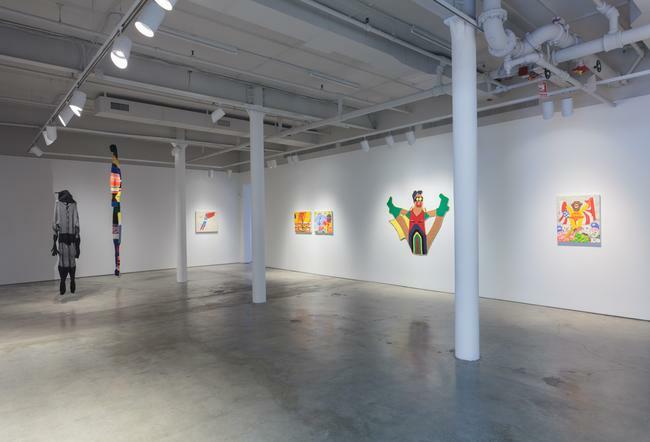 The flat, coarsely-rendered, carnivalesque scenes have a palpable sense of immediacy; Williams painted the series in only six weeks in early 2015, responding to the recent deaths of black men at the hands of police officers. In these unapologetic works, Williams’ protagonist rises up again and again, questioning assumptions of how patriotism, race, violence and power intersect. Lastly, Nathaniel Mary Quinn’s portraits assemble images of people from memory, yet reveal as much about the artist as about his subjects. Growing up impoverished in Chicago, losing his mother at a young age and being abandoned by his father and brothers, Quinn brings the weight of his fragmented personal history to these works, constantly attempting to reconcile the past with the present. Imagery from family portraits, advertisements, and popular culture all come together to form these disorienting and grotesque reconstructions. Just as Quinn reveals the complexity of how identity is built through an assemblage of contexts, ideas and experiences, the artists in conversation in Secret Identities: Superheroes and Selfhood establish multivalent discourses on gender, sexuality, race and politics, and how such discourses shape personal and cultural narratives.